Since the Austin Harrouff attack, a new mental health report has emerged that shows how his defense attorney will argue that Harrouff was insane at the time of the accused attacking and mauling of a Martin County couples and causing severe bodily harm to a neighbor who tried to intervene. Austin is accused of killing Michelle Mishcon and John Stevens in their garage back in 2016, then proceeding to attack their neighbor, Jeff Fisher, who tried to intervene and help the two. According to the investigators they claim to have found Harrouff chewing on Stevens’ face. The defense team recruited the help of a Forensic Psychiatrist, Dr. Phillip Resnick, to examine and determine whether he met the criteria for insanity on the exact date of Aug.15, 2016 — the time of the attacks. The report of Dr. Resnick’s concluded Harrouff did have a severe mental health disorder at the time of the accused attacks, commonly known as Bipolar I Disorder, and Acute Manic Episode with Psychotic Features. The doctor explained that his review involved an intense six-hour interview with the suspect at the Martin County jail. Resnick also reviewed Harrouff’s journal, online searches, and videos, an interview with Dr. Phil, including interviews with numerous friends and family members. He concluded in his report that there was a pattern of concerning behavior in the months, and days leading up to Aug. 15. He also claimed that a month before the attacks, Harouff reported feeling elevated moods and acting out of character, for example having an unusual obsession with having a rap music career out of nowhere. In addition to those findings, weeks before the attack, Harrouff began to feel like he had supernatural powers, thinking he was Jesus and would be followed and worshipped. Resnick also said Harrouff felt so indestructible that he would randomly walk out into the streets in front of moving cars. The investigators found words like “mania” and “hallucinations” on Harrouffs computer, he also searched whether he was going crazy multiple times. In the report, it said that Harrouff thought there were evil spirits in his home, he believes it so much that he started to sleep next to his sister in fear and also to protect her. Resnick also found a receipt for a knife that he purchased days before the attacks for protection. According to Harrouffs sister, he thought he was half man-half dog just days before the attack. He said he could run super fast and would wander off through the bushes to be “one with the animals” or sat in the backseat as a dog would. The night of the attacks, the police said that the suspect was at Duffy’s in Jupiter, fought with his dad, and left in a hurry. During his walk home, Harrouff told Resnick he saw someone with a white face and dark clothing, whom he thought to be evil and quickly became scared. The reports later stated that the ” white face” turned out to be a family member. According to Harrouff he saw a light from Michelle Mishcon and John Stevens’ garage and made his way toward it screaming for help. When Mishcon saw Resnick running towards her, she screamed, and Harrouff thought she was a witch and attacked her violently. While attacking Michelle Resnick said Harrouff became frightened when Stevens showed up and started to attack him. That is when the neighbor, Jeff Fisher tried to intervene and save the couple, but Harrouff vaguely recalled stabbing Fisher too. The report claimed that Harrouff did not remember encountering police, although he remembers waking up in the hospital. Dr. Resnick reviewed the medical reports taken at the hospital and found that he was making howling sounds and “writhing in contortions” at the emergency room. Before the mental health investigation, Resnick contemplated if Harrouff was faking any of the stories to help his insanity case, although after the new report he concludes that he was not. 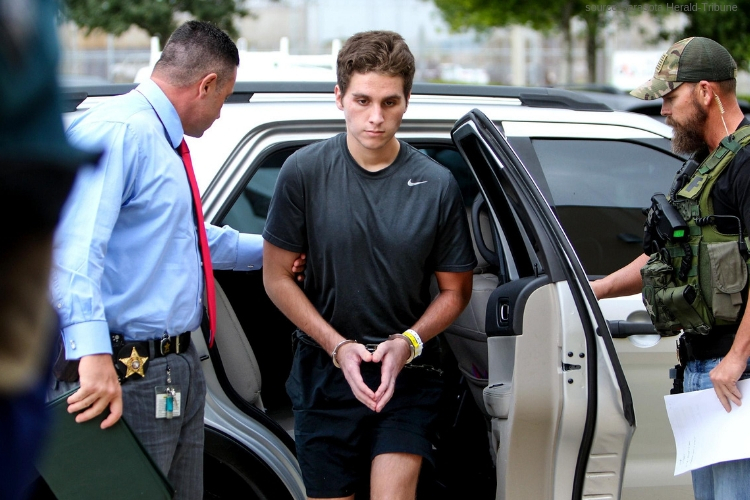 The case is set for November 2019 to go to trial, Harrouff’s attorneys have announced that they will use the insanity defense throughout the trail. The case is still an on-going investigation.